As the temperature increases, the molecules in the ice move around causing it to start losing its solid shape and turning into a liquid. At its core ice and water is the same thing. 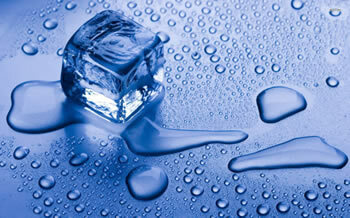 The only difference is that ice is the solid form of water, while water is the liquid. Bonus fact: its gaseous form is water vapor. Well, we know that when water freezes it turn to ice, and when ice melts it turns to water. However, what causes this phenomenon. Water, like everything else in the world, is made up of tiny particles called molecules. One drop of water has millions of molecules, we just can’t see them. Each molecule is further made up of one oxygen atom and two hydrogen atoms. These atoms are held together by bonds. The bonds connect the atoms to make a molecule, and the molecules clump together to make water. Each molecule needs its own personal space. The amount of space between the molecules decides whether the substance will be in a solid state, liquid state, or a gaseous state. When there is enough pressure acting on the water, such as the cold air in the freezer, the molecules come closer together. Think of people hurdling closer together in a snowstorm to keep themselves warm. As the space between the molecules keeps reducing, the water starts converting to ice crystals, and eventually to an ice cube. Once the ice is removed from the freezer the pressure of the cold air is released. Regular air is lighter than cold air, hence the molecules are no longer compressed together. They can start to roam around. As the pressure is no longer there, the molecules get excited and start moving around. When they start moving around, the space between the molecules increases as they start moving in all directions and away from each other; hence, the ice is unable to keep its solid form and ends back into a liquid, i.e. water.